No, she’s not pregnant, but she does have a thickened heart valve. Our beloved dog Alice Brown, 8, is aging like the rest of us. 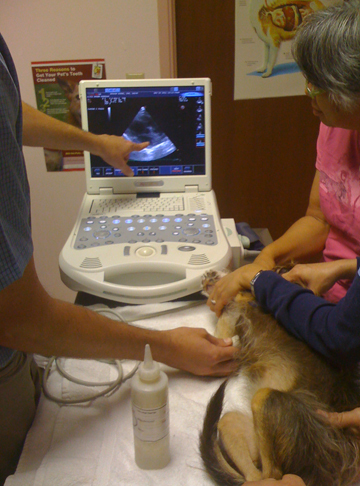 Hearing a heart murmur last week, “Doctor Sterling” recommended an ultrasound to give us more information. This morning we watched the images of Alice Brown’s heart and valves, and we saw and heard the abnormal back flow of blood. With our okay, the vet prescribed some heart medicine, saying, we have the luxury of finding this condition early so that it might be monitored and eased with meds. This condition is common in small dogs, he said.